Discover all the efficiency and productivity that's possible when the appraisal software you're using is simple and intuitive. Easy to use doesn't mean that ClickFORMS lacks the features you want and need. Sophisticated features are built right into Clickforms. 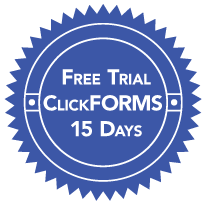 Try all the time-saving features of ClickFORMS and get free technical support for 15 days – no hassle, no risk, no obligation!